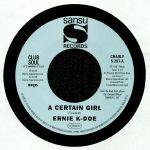 Review: This desirable 7" single brings together two of the many highlights from the bulging catalogue of New Orleans soul singer Ernie K Doe. On the A-side you'll find 1961's "A Certain Girl", a sweet rhythm and blues number from the dawn of the soul era that ticks all the right boxes (strong lead vocal, jaunty piano lines, lolloping groove, question-asking female backing vocals). Arguably even better is the better known "Here Come The Girls", a later K-Doe recording that was produced by the song's writer, Allen Toussaint, and originally appeared on the artist's eponymous 1972 album. We all know it, of course, but it still remains a sing-along soul staple.